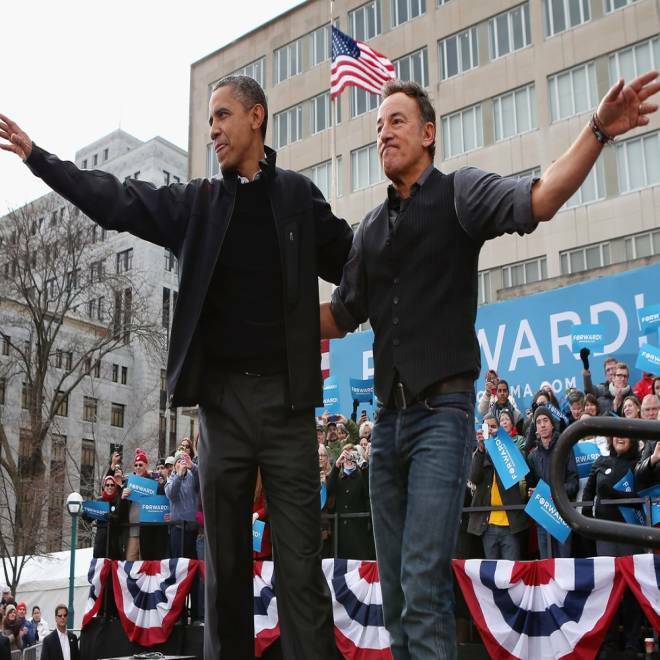 MADISON, WI – Kicking off his last full day of campaigning here, President Barack Obama enlisted rocker Bruce Springsteen to motivate supporters who have already voted and those who will head to the polls Tuesday. President Barack Obama and rocker Bruce Springsteen wave to a crowd of 18,000 people during a rally on the last day of campaigning in the general election November 5, 2012 in Madison, Wis. Taking the stage just after Springsteen finished an acoustic set, the president touted the fact that Springsteen will be hitching a ride on the presidential aircraft from Madison to the next campaign stop in Columbus, Ohio. “I get to fly around with him on the last day that I will ever campaign. So that's not a bad way to end things,” he told the crowd of 18,000 gathered in a square near the state capitol, which was festooned with a giant American flag. President Obama speaks at a campaign event in Madison, Wis. Watch his entire speech. But Obama also used the rock star’s appearance to drive home a serious message about one of his signature agenda items: allowing the lower Bush-era tax rates for the wealthiest Americans expire. In 2008, Springsteen’s appearances on behalf of the president underscored Obama’s image as a transformational figure of inspiration. But even The Boss acknowledged during his performance that despite his four years in office, the environment in Washington had not changed. “President Obama ran last time as a man of hope and change, and you hear a lot of talk about things are different,” Springsteen said. “Things aren’t any different now. They’re just realer. It’s crunch time now,” he continued. After the rally, the president and Springsteen boarded Air Force One together to head to Columbus for another joint appearance.